Actor Chris Rock speaks during a press conference hosted by the Mayors Against Illegal Guns and the Law Center to Prevent Gun Violence at the U.S. Captiol February 6, 2013 in Washington, DC. It passed under the radar yesterday, but it was unthinkable two weeks ago. Virginia’s mid-decade gerrymander, passed by a sneak state Senate vote, was killed by the Assembly speaker before it could be tossed to a harrumphing Gov. Bob McDonnell. Ali Gharib recaps the Hagel delay, which he calls a “witch hunt.” Certainly the arrival of the Atlantic Council as a shadowy engine of foreign influence is a little strange. 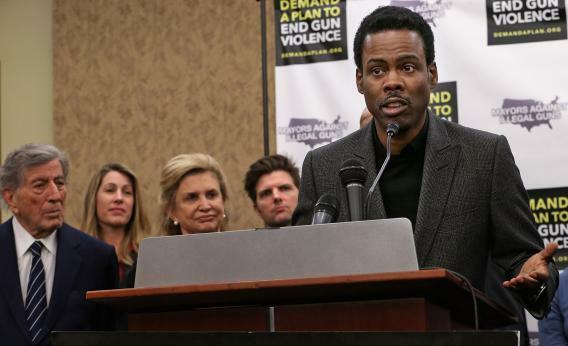 Chris Rock makes the worst argument possible for gun control. The president and the first lady are kind of like the mom and the dad of the country, and when your dad says something, you listen. No! Come on, what happened to the “bullet tax” joke? That wasn’t actually a terrible policy idea. Ana Marie Cox crystallizes the “Fox is purging crazies” concept. Witness the coverage of Benghazi, where conservative outrage on the channel remains strident and forceful and in harmony with Republican officials, despite the willingness of most of the country to move on to matters closer to home. It’s a positive feedback loop that spirals into irrevelance: [sic] Republicans pursue a conspiracy that only Fox viewers believe, based on reports only Fox airs, and new information gets hammered into a shape that fits the existing narrative.